And this cute girl is now accessorizing with glasses! 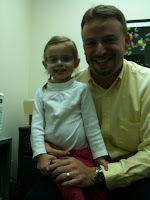 We found out in February that Hannah Claire needed glasses. We’d noticed that her left eye was pulling in every so often and at her three year old well visit the pediatrician asked us to have her seen by a pediatric ophthalmologist. Based on other people we knew who had similar symptoms, we thought we were dealing with a muscular issue and that Hannah Claire would likely be treated with a patch or maybe even surgery. Turns out she is far-sighted, and they think her left eye is pulling in because it’s the weaker eye and has to work harder to focus. So, rather than treating the muscle, she will wear glasses with the hope that when she is seeing correctly the left eye will quit turning in. 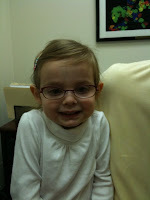 She has adjusted to her frames wonderfully and (not that I’m biased or anything) looks like a doll in them! 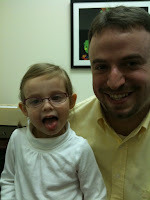 We went back for a follow-up last month and the doctor says she’s doing great. Since the left eye learned to focus “incorrectly”, she’s still relying more on her right eye to see so we will need to do some patching for a couple hours a day at home. Hannah Claire picked out a cute patch with a fairy on it and, so far, she loves wearing it. I’ll try to get a picture of her sporting the patch sometime soon!